The first three days of Navratri are dedicated to Goddess Durga (Warrior Goddess) dressed in red and mounted on a lion. 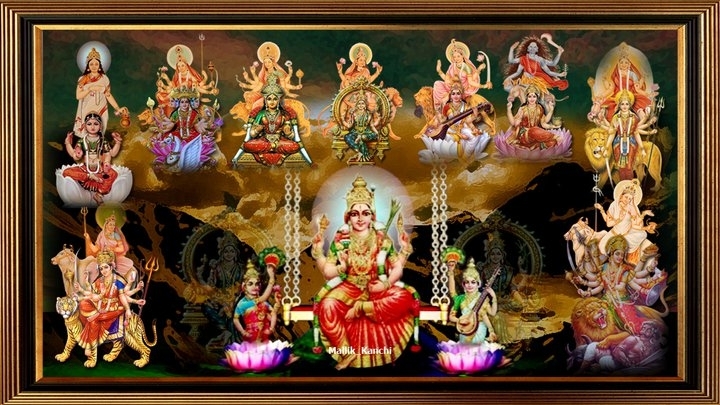 Her various incarnations - Kumari, Parvati and Kali - are worshipped during these days. They represent the three different classes of womanhood that include the child, the young girl and the mature woman. Next three days are dedicated to Goddess Lakshmi (Goddess of Wealth and Prosperity), dressed in gold and mounted on an owl and finally, last three are dedicated to Goddess Saraswati (Goddess Of Knowledge), dressed in milky white and mounted on a pure white swan. Sweetmeats are prepared for the celebrations. Children and adults dress up in new bright-colored dresses for the night performances. The Hindu festival of Navratri, which extends for nine days, is celebrated with gusto in different regions of the country. In the eastern state of West Bengal, the festival takes the shape of Durga Puja, when the devotees of the deity celebrate the triumph of good over evil. There, Ma Durga is worshipped as Goddess Shakti. In north India, Maharashtra and Gujarat, people observe a seven day fast during Navratri and break their fast on Ashtami (the eighth day of the festival) by worshiping young girls. However, some people observe fast until the Ashtami and break their fast only on Navami (the ninth day). If you want to know more about Navratri fast, then explore the article. On the festive occasion of Navratri, fast is observed by people for seven or eight days, depending upon when they want to conduct the Kanchika Pujan (when young girls are worshipped). The devotees, who have observed fast, would get up early in the morning, take bath and offer prayers to the deity. People follow a specific diet for Navratri, if they haven't observed a nirahar (waterless) fast. Most people nowadays perform partial fasting. They would abstain from non-vegetarian food, alcohol and those dishes that are made of common salt or any kind of spice. Singhare ka atta (kuttu ka atta) is used to prepare rotis or puris, for the fast. One may drink beverages like tea, coffee and milk, on Navratri. Dishes made of sago and potato is generally consumed by the people, when they observe fast on Navratri. Sendha namak (rock salt) is used instead of common salt, for cooking on the festival. All fruits and foodstuff made of fruits are eaten during the seven days. Nowadays, ready-to-eat snacks are available in the stores, especially prepared for Navratri. In addition to this, certain restaurants in the northern parts of India would offer special menu for the people, who have observed fast on Navratri. After seven days of fasting, people would break their fast on the eighth day - Ashtami - by worshipping young girls. The ritual of offering prasad to the young girls is called Kanchika Pujan. As per the tradition, puris (deep fried Indian bread), halwa (sweet dish made of suji) and Bengal gram curry are served to the young girls, called upon by the people who have observed fast. After seeking the blessings of the young girls (kanchikayen), the devotees would break their fast by consuming the prasad (puri, halwa and sabzi) that they have prepared for them. While this is the tradition followed by majority of people, Navratri fast is also broken on ninth day (Navami), wherein the fast is observed until Ashtami. The same procedure is followed in that case as well. 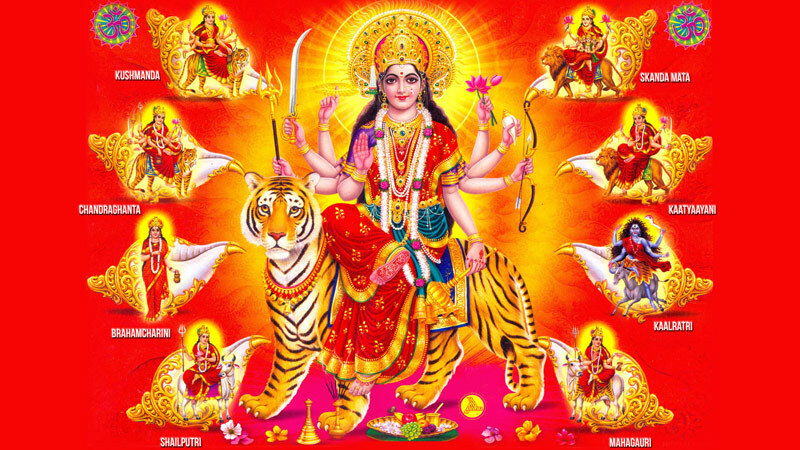 The festival of Navratra is celebrated twice in India. Once in the Hindi month of Chaitra which is the month of March-April according to the Gregorian calendar and again in the month of Ashwin i.e. September-October according to the English calendar. It is a nine days long festival in which the Goddess Durga is worshipped in nine different forms. People all over the country celebrate this festival with immense joy and enthusiasm. Devotees of Maa Durga observe a rigorous fast of nine days during this period. This festival in Hindu religion is considered to be an eternally enlightening festival. Like most of the Hindu festivals this worship also involves reading or hearing Katha or stories related to the festival. Explore an interesting story about Navratri here, in this article. Purana, Vamana Purana, Varaha Purana, Shiva Purana, Skanda Purana, Devi Bhagavatam and Kalika Purana. 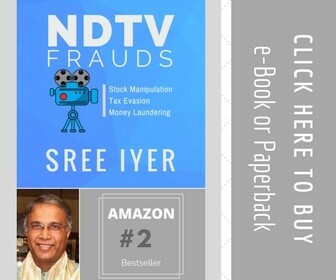 The story of Navratra is the symbolic message of the fact that however glorious and powerful the evil become, at the end it is the goodness that wins over all of the evil. The story is associated with Maa Durga and Mahisasura, the buffalo headed demon. The story begins from the life of two sons of Danu called Rambha and Karambha who performed austerities by to gain extreme power and authority. When their prayers became deeper and austerities became exceptional, the King of the heaven God Indra got perturbed. Out of fear, he killed Karambha. Rambha, who came to know about his brother’s death, became more stubborn to win over the Gods. He increased the intensity of his austerities and finally got several boons from gods like great brilliance, beauty, invincibility in war. He also asked a special wish of not being killed by either humans or Gods or Asuras. He then considered himself immortal and started freely roaming in the garden of Yaksha where he saw a female-buffalo and fell in love with her. To express his love, Rambha disguised in the form of a male-buffalo and copulated with the female buffalo. However, soon after that a real male buffalo discovered Rambha mating with the she-buffalo and killed him. It was due to Rambha’s inflated ego that killed him, out of which he has not asked his death to be spared from the wrath of animals. As the pyre of Rambha was organized, the female-buffalo, who was copulated with him jumped into the funeral pyre of Rambha to prove her love. She was pregnant at that time. Thus, demon came out of the with the head of a buffalo and human body and he was named Mahisasura (the buffalo headed demon). Mahishasura was extremely powerful. He defeated the gods and the demons and acruierd power over the entire world. He even won over the heaven and threw devtas outside it. He captured the throne of Indra and declared himself to be the the lord of the gods. The gods led by Brahma approached Vishnu and Shiva and evaluated them of the situation. In order to save the Gods, the three supreme deities emerged a light of anger, which combined to the take the shape of a terrible form and this was Durga. All the gods then granted this Goddess of power with all the supreme weapons they had. This is why; Durga is called the brilliance of all the Gods. When the goddess was seen by Mahishasura, he was mesmerized by her beauty. Her then fell in love with her and proposed to marry her. The goddess said she will marry him, if he defeated her in the battle. Then began a scary and terrible battle between both of then which continued for nine days. Finally, on the last day, Durga took the form of Chandika and stood over the chest of Mahishasura and smashed him down with her foot. She then pierced his neck with her spear and cut off his head off with her sword. It is the day when Vijayadashmi is celebrated. ॐ First Day - The first day is dedicated to the Goddess Durga is called Shailputri, the daughter of the Himalayas. She is a form of Shakti, the companion of Lord Shiva. ॐ Second Day - The second day is dedicated to the Goddess Durga is known as 'Brahmacharini'. The name is derivative of the word 'Brahma', which means 'Tapa' or penace. She is also a form of Mata Shakti. ॐ Third Day - The third day is dedicated to the goddess Chandraghanta, the symbolic representation of beauty and bravery. ॐ Fourth Day - The fourth day is dedicated to the goddess Kushmandas, the creator of the entire Universe. ॐ Fifth Day - The fifth day is dedicated to the Goddess Skand Mata, the mother of the chief warrior of the Gods army the Skanda. ॐ Sixth Day - The sixth day is dedicated to the goddess Katyayani with three eyes and four hands. ॐ Seventh Day - The seventh day is dedicated to the Goddess 'Kalratri', meant to make the devotees fearless. ॐ Eighth Day -The eight day is dedicated to the Mata Rani or 'Maha Gauri', represents calmness and exhibits wisdom. ॐ Ninth Day - The ninth day is dedicated to Durga also referred as Siddhidatri. It is believed that she has all the eight siddhis and is worshipped by all the Rishis and Yogis. ॐ Chaitra Navratri ends – Ram Navratri Day 9 – April 19/20, 2013 The day is observed as Ram Navami. Ramnavami or the birthday of Lord Rama falls on the 9th day of the bright fortnight. Since Rama is the 7th incarnation of Vishnu having born at noon, temples and family shrines are elaborately decorated and traditional prayers are chanted together by the family in the morning. Also, at temples special havans are organized, along with Vedic chanting of Vedic mantras and offerings of fruits and flowers. The day is also celebrated as the wedding anniversary of Sri Rama and his consort Sita. There are two Navratri celebrations in India. 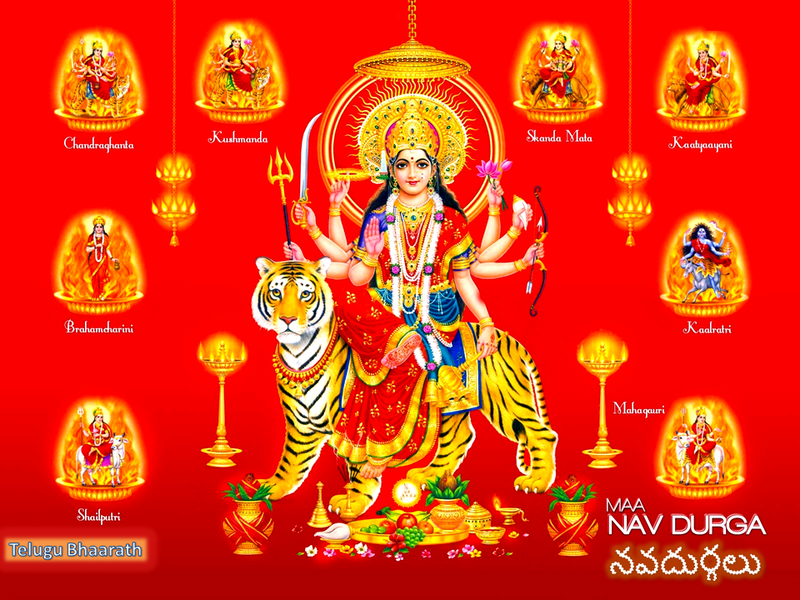 The first Navaratri is called the Chaitra Navratrai and the second is called Ashwin Navratri. The first one is celebrated in the month of March- April and the second is celebrated in the month of September – October according to the Gregorian calendar. 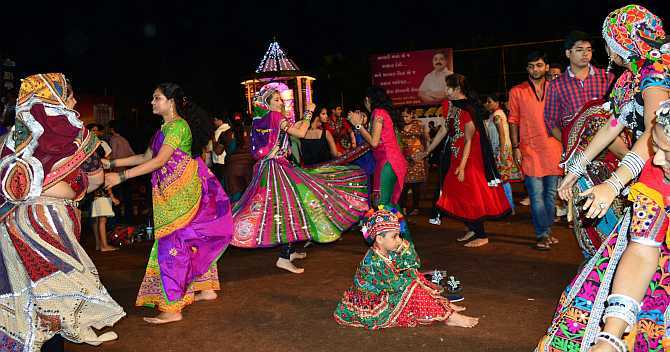 The celebrations of both these Navratri is full of devotion, joy and passion in the country. The nine days festive celebrations fill the entire atmosphere with colors of devotion and love for the deity. Devotees of Maa Durga observe fast for the nine days. They fill the surroundings with mantras, sholkas and bhajans dedeicated to Mata Rani and make the entire atmosphere pious and sanctified. Lyrics of few of the popular Navratri devotional songs are given below, you can sing them in the coming Navratri celebrations. Many of us must be knowing this verse but not the meaning. Namostute- We bow to you again and again. We worship you. I bow to her, I bow to her, I bow to her again & again. I salute to you. Take my salutations again and again. O mother of the world Jagdamba, you are the one who looks after her children. Your love and kindness towards me is no surprise O mother goddess. Being a mother you forget all our sins and correct us without abandoning your children. Sloka Meaning: Salutations again and again to the Devi (Goddess) who dwells in all living beings as power and maya of Lord Vishnu. Jayanti Mangala Kali, Bhadrakali Kapalini Durga Kshama Shiva Dhatri Swaha Swadha Namoastute. !Om Sri Durgaya Namah!! Happy Navratri !